Most people who hang out at Tufts have picked up the notion that the Floating Hospital for Children, now part of Tufts Medical Center and a flagship institution in the field of pediatric medicine, began life as a boat of some kind. (Hence the nicely buoyant name.) But the details on that early evolution are hazy at best. Who cast off the mooring lines, and why did they do it? From 1855 to 1865, more than 96 children out of every 1,000 in Boston died before they were 5 years old. Lemuel Shattuck, a Massachusetts public health pioneer, wrote in 1845 about one poor section of Boston that “children seem literally ‘born to die.’ ” The rise in deaths was due to diseases that found a breeding ground in the poorly ventilated, unsanitary surroundings of the urban slums that had sprung up to house the thousands of new immigrants. These included diphtheria, measles, scarlet fever, whooping cough, cholera infantum, dysentery and a host of other maladies ravaging the poorest children of the city. The origins of the Floating [Hospital] were simple and modest. Its founders wanted a practical solution to a pervasive problem: Poor children were dying by the hundreds during the summer from intestinal diseases that were rampant in the crowded slums. The doctors of that time were only beginning to forge weapons against these intestinal illnesses, but they knew that if children could get into the fresh air, away from their environment, if they could be given good food and compassionate medical care, they would have a better chance to recover. On the morning of July 25, 1894, those citizens of Boston who regularly took an early morning stroll near Snow’s Wharf were astonished to see the barge Clifford being towed out into the harbor. Typically, the Clifford returned to her berth at midnight, after a night during which her decks were crowded with revelers out for a romantic cruise. But now, where deck chairs and dining tables had stood, there were hammocks and cots. The bar and the bandstand had been replaced by hospital gear. If they had been able to go belowdecks, those who saw the Clifford that morning would have noted the lower decks had been divided into wards and a dispensary. From the roof of the Clifford’s cabin hung a 20-foot-long white banner emblazoned with green crosses. The barge no longer resembled a pleasure craft. 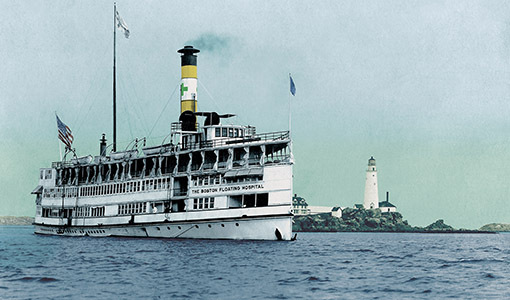 Between midnight and its 9 a.m. departure time, the Clifford had been transformed into the Boston Floating Hospital. People of all sorts, well-to-do and middle class, fashionable society ladies and children, garden clubs and sewing circles, were all attracted to helping the hospital and its little patients. In just a few years, it became one of Boston’s most popular charities. In those [late 19th-century] days, most hospitals still purposely prevented the parents from visiting their children—or at least discouraged them from doing so. Visiting hours were deliberately set during the working weekday, and there were no visiting hours on weekends. Healthy children were not permitted in the hospital. These stringent rules made it virtually impossible for parents to find the time to see their sick children. 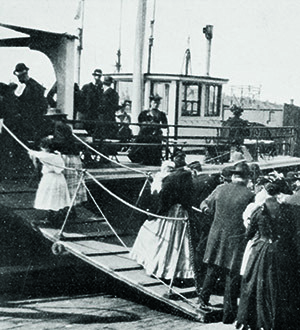 By contrast, the Floating routinely provided free access to parents of all patients. 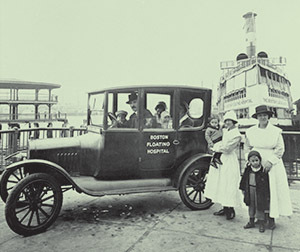 The doctors who served on the Floating in the early days came from the Boston Dispensary, which was established in 1796 as the first permanent medical facility in New England [and predecessor to today’s Tufts Medical Center]. In 1856, the Boston Dispensary abolished the prevailing system that allowed wealthy subscribers, by dint of their support, to indicate who was to be treated. Doctors who joined the Floating brought this enlightened culture with them. Unlike most of the hospitals of that time, the Floating did not look down on uneducated mothers or blame those immigrant women who did not understand much English and needed help in learning how to take better care of their children. For example, it was part of the routine for the doctor at the gangplank to search the bags mothers brought on board for contraband food. But this was done in a kindly, gentle and nonjudgmental manner so that mothers would not consider it a punishment. The unhealthy food and drink they tried to bring aboard was destroyed after explanations about why this was necessary. Mothers were given vouchers in exchange for their food, entitling them and their healthy children to lunch on board, and refreshments were served later in the day. However, mothers were not only permitted to remain on board with their babies—they were, from day one, encouraged to form a partnership with the doctors and nurses overseeing their children’s care. The children were treated with compassion, the mothers with dignity. 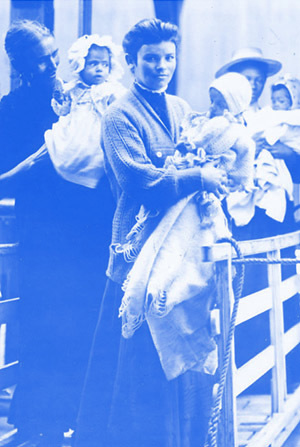 Moreover, by 1896, the Floating recognized that there were often other children in the family who could not be left alone at home, and mothers were allowed to bring one healthy child onto the boat if necessary. The Floating provided a kindergarten for healthy children under the age of 6. This daycare facility gave mothers time to concentrate on their sick child and provided the healthy youngster with a pleasant excursion at sea. From the first voyages of the Floating, there were classes to teach mothers how to take better care of their children. These classes became more formalized as the years went by. From the nurses who traveled around Boston collecting donated breast milk to the invention of formula, the Floating was always at the forefront of infant nutrition and the advances in the treatment of milk. By the turn of the 20th century, when a food laboratory had been established on board, doctors were using 20 different kinds of food or combinations of food to prepare formula on the Floating. The hospital’s work established how modern-day doctors, nurses and parents view and use milk and formula. 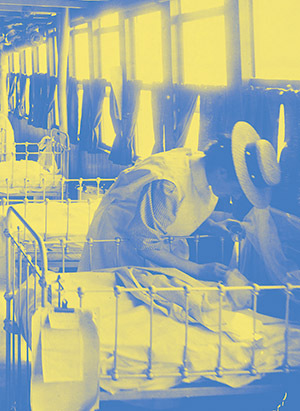 By 1909, the Floating was the largest and most important infants’ hospital in the United States, because it offered doctors an opportunity to study the largest number and variety of the diseases of infants. Intestinal diseases continued to be alleviated and controlled through modifying the babies’ food, and because milk was basic food for young children, the investigators increasingly focused on the role of milk in those illnesses. The Floating was a pioneer in providing formulas made from cows’ milk and other ingredients to its patients. New scientific advances made it possible for the Floating’s food lab to furnish a formula carefully calibrated to suit the needs of each infant. Patients who were sent home were given enough milk to ensure that they would have the benefit of 24 hours of pure milk—beginning the day they arrived on board. Even on the water, the [Boston summer] weather could be oppressive, especially to children suffering from intestinal diseases. The innovators who put a hospital on a barge, however, did not accept this as an insurmountable problem. In 1898, the directors began to look for a way to “modify the air in our wards in such a way that our patients shall have dry air of moderate temperature which shall be uniform irrespective of the weather.” They heard that Lowney & Co., chocolate manufacturers in Mansfield, Massachusetts, had “modified” the air in their factory at a cost of $20,000. If $20,000 could be spent to cool chocolates, the Floating should not hesitate to find a way to reduce the temperature in its wards in order to save the lives of children, the directors stated. It would be an extraordinary addition to the hospital, to any hospital, at that time, but the dedicated board of directors had decided it was a necessity and consulted an engineer from MIT. By the following year, the new “Atmospheric Plant” had been installed. So it was that in 1899, a small hospital established only five years earlier and functioning on a remodeled barge in Boston Harbor, became the first hospital in America to air-condition its wards. By the time of the [current Floating Hospital’s] groundbreaking ceremony in 1979, the estimated $38 million cost for construction had risen to $55 million because of inflation. A 100-foot “bridge” of glass and steel, 35 feet above ground, connects the two parts of the building. Just one short flight above the lobby, a children’s waiting room has been built in the shape of a boat. Miniature portholes can be seen from the street through the glass walls of the building. Inside the room, children can play in the “wheelhouse” and pretend they are sailing in the harbor. Today, most of them probably do not realize that the room was built as a fond tribute to an old hospital ship. The evening party barge Clifford is launched as a daytime hospital ship on Boston Harbor to serve sick children during the summer months. Clifford purchased for $5,000 and converted to full-time medical use. The Floating is first U.S. hospital to have air-conditioning. A much bigger ship is designed, built and launched as the new Floating Hospital; it features a large, airy dining room, clinical laboratory, a kindergarten and six wards containing 100 beds on the main deck. 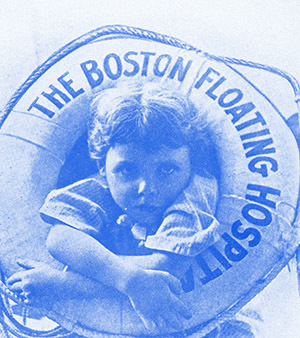 The Floating ranks as largest, most important hospital for infants in the U.S.
First on-shore branch of Floating established at Norfolk House Center, a building housing various charities in Roxbury, Massachusetts. Soon after being docked for repairs in East Boston, the Floating is destroyed by fire, marking the end of shipboard medical care. The glare from the blaze could be seen in Salem, Massachusetts, 15 miles away. 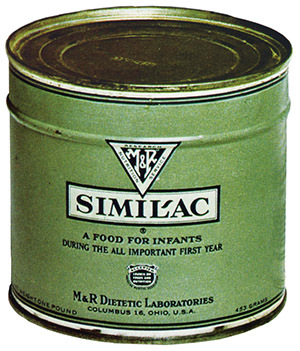 The infant formula Similac, derived from years of research aboard the Floating, is first released in commercial form. Formal affiliation established between Boston Dispensary, Floating Hospital and Tufts Medical School. neighborhood; by this time, more than half of practicing pediatricians in New England had been trained at the Floating.